Simply speaking, a fixed header (aka: “sticky header”) is a section of a page that has a fixed position at the top of the screen and doesn’t disappear when scrolling the page. Probably the biggest advantage of a fixed header is that it allows the user to easily and quickly jump from the bottom of a page to the top without the need to scroll up the entire page. To build our fixed header we will use two pages, an element called “scroll frame”, and a little trick: We simply divide the page into a fixed header section and a scroll section and only let the content of the scroll section (defined by the scroll frame) scroll. The other page will just serve as a container for the scrollable content and be linked into the main page. 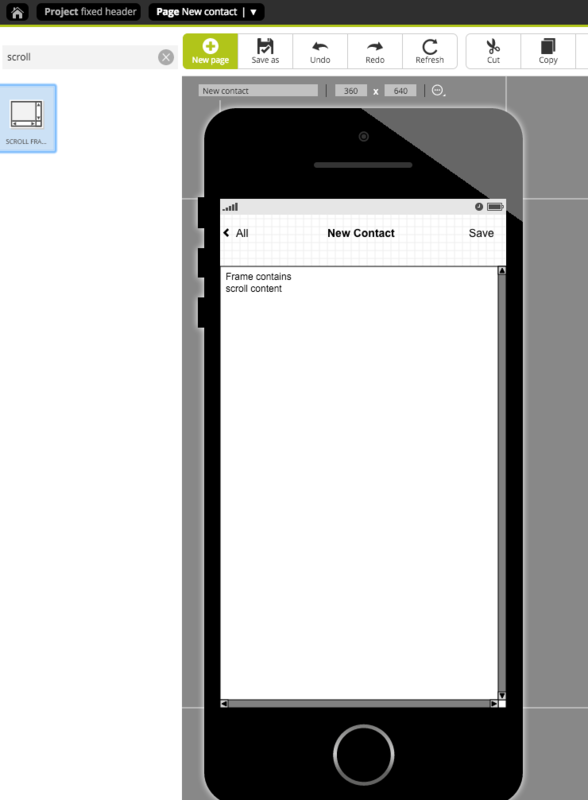 As an example, I have chosen the “New contact” screen of an imaginary address book app. 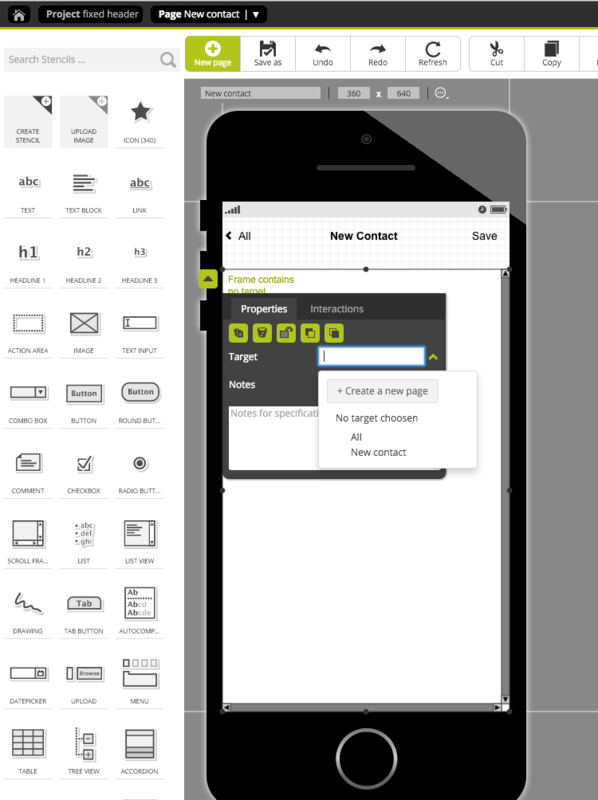 The sticky header section of the screen contains a navigation bar that gives the user two main options: going back to the contact list or saving the new contact. The section below the header lets the user add contact details and is scrollable due to the many options including name, address, telephone number etc. Here’s a preview of what my finished address book will look like. We start off with creating the sticky content of our screen, i.e. the section containing the fixed header. 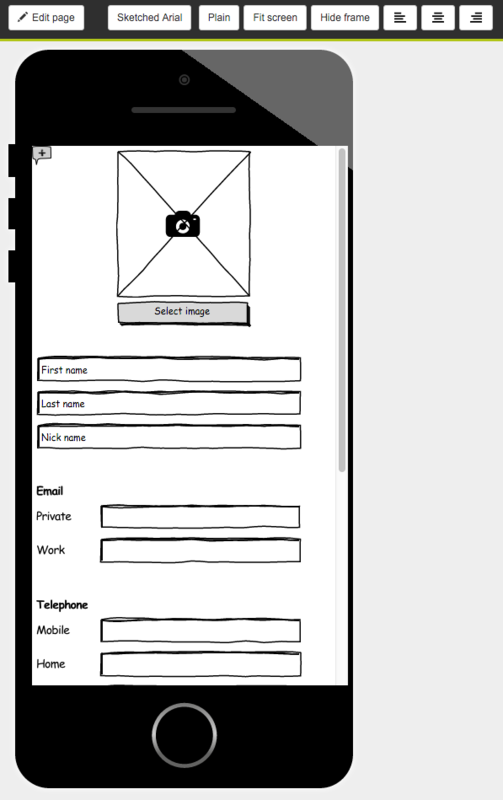 To do so, create a new page (smartphone portrait format) and add all elements that should not scroll with the page. 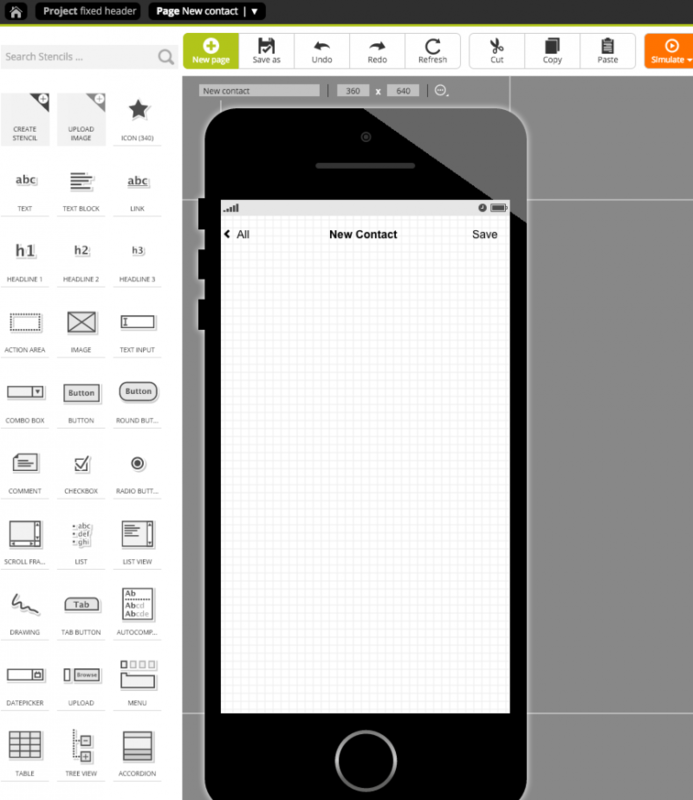 In my example, this includes a status bar as well as a navigation bar with a title and two navigation controls. Now let’s create the part of the screen that that will scroll. To do so, add a scroll frame stencil to the page and resize it to cover the entire part of the screen that should scroll. Now open the context menu of the scroll frame and click the “Create a new page” option from the “Target” dropdown. This will do two things: Create a new page, which be the container for the scrollable content of the main page, and link the new page into the main page via the scroll frame. Now, all that’s left is adding the scrollable content to the new page. To actually be scrollable, however, the new page must be longer than the main page. So, make sure to increase the length of the page. 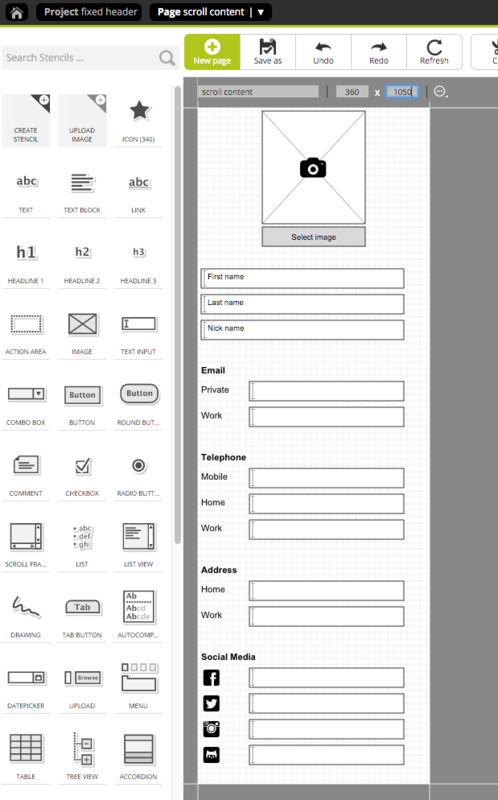 In my example I added several text input elements and text elements as well as icons to create a complete contact details form, including even a profile picture. Finally, we can preview the result by clicking on the “Simulate” button in the toolbar. Here is what my finished project looks like. That’s it! You have successfully created a scrollable page with a sticky header! Do you need help with your project? Then do not hesitate and drop us a line via support@pidoco.comor Facebook and Twitter.